These lights replace exisiting front door lighting so install is fast with no additional wiring or drilling required. Call Mercedes-Benz Edmonton West at (780)484-9000 and book your Mercedes in today! Get 20% off on all Mercedes-Benz Genuine Car Care Products. Call Mercedes-Benz Edmonton West at (780)484-9000 for more information. We are pleased to announce a new Sprinter accessory that will improve winter vehicle operation. Note:** Usage of the grille cover is for temperatures below zero (0) Celsius only. $326.15 plus installation. Call our Parts or Service Department today! 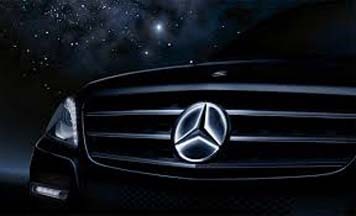 The Mercedes-Benz illuminated Star is a stylish and sophisticated way to define your vehicle. For over 125 years, the Mercedes-Benz star has remained a symbol of quality and craftsmanship. Currently available for 2012 and newer M-Class only. Available for other models later this year. Illumination of the central star in the radiator grille via LED technology. Star illuminates briefly when unlocking the vehicle via remote key or when opening door/tailgate.